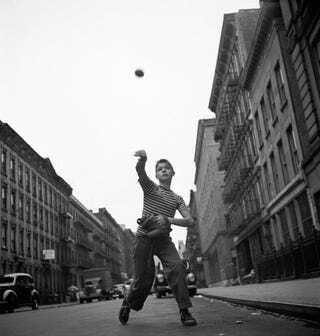 I used to play stickball with my pals out in Brooklyn in the late '90s. One summer morning I was pitching and getting bombed. When I tried to be cute, I didn't come anywhere near the box on the wall. When I tried my best David Wells and just put the ball over the plate, they murdered me. So there I was, aiming the ball, with no confidence that I could throw strikes or record an out. I was red-faced, sweating and felt all alone. My younger brother, who was on my team that day, walked over to me. “You okay?” He touched my arm. He knew I was starting to implode and also knew there was nothing he could do to make it any better. Funny how hard it is to lose sight of that when you can’t throw a strike and when you do it gets belted. I was a redass anyhow and never had much fun unless I was winning. With the Yankees losing 18-3, in the bottom of the eighth in Texas–even after a few days, the score still reads like a typographical error—Lou Piniella did the unusual, though not the unreasonable. Rather than waste one of his regular relief pitchers in that forlorn enterprise, he saved his sirloin and served the Rangers chopped liver. The chopped liver was Rick Cerone, normally a catcher. Cerone was fetched because he sometimes throws batting practice, and gets the ball over the plate. Cerone admitted later that he was excited about pitching in a game. “It’s something you always dream about,” he said. He arrived with the bases loaded and none out and, though he balked once and allowed two runners to score, he retired the Rangers on three straight batters, which included a near-grand slam by Ruben Sierra and a near-home run by Bobby Witt. How did he feel on the mound? Pitcher's Do Get Lonely is also the title of a good collection of Berkow's columns.